I’ve just got the first 8 days. I’m not going to put a proper visual caption on these. They’re OK for a bit of visual distraction if you can see, but they just aren’t worth the effort to describe. It’s so much digital ephemera. 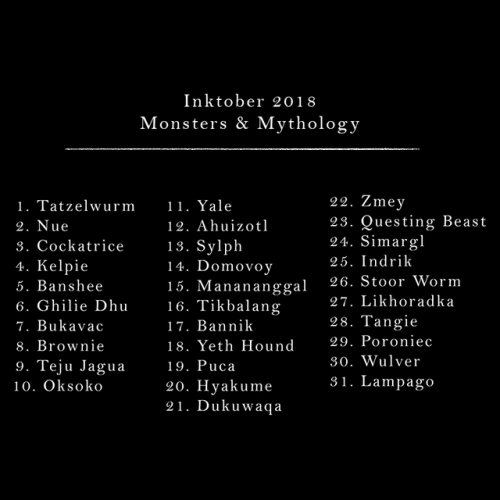 For this (my first) Inktober, I’m combining the Monsters & Mythology prompts plus the Official Prompts. You can still tell I did the under-drawing for all of these with a yellow sharpie, so I couldn’t erase it. I think that kinda stuff looks fun in a drawing but I know some people hate it, so sorry about that.